The SANOG 32 meeting was held on 2-10 August 2018 in Dhaka, Bangladesh, which marked fifteen amazing years of collaboration between network operators in the South Asia region. The Internet Society is proud to support the SANOG fellowship programme that provides opportunities for network engineers from countries in the region to attend, as well as organising the Network Security workshop during the event. 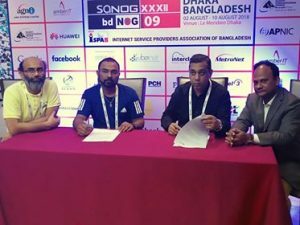 SANOG 32 also saw another MANRS milestone reached when the ISP Association of Bangladesh (ISPAB) signed a Memorandum of Understanding (MoU) with the Internet Society. ISPAB is a membership-based, not-for-profit organization that provides a forum for Bangladeshi ISPs to discuss technology, policy, regulatory and commercial issues and find collective solutions. In accordance with the MoU, both ISPAB and ISOC will work together to promote and support MANRS, to encourage network operators in Bangladesh to join the initiative. There are currently only two MANRS participants in the country, so being able to increase engagement with the networking community is a welcome development. 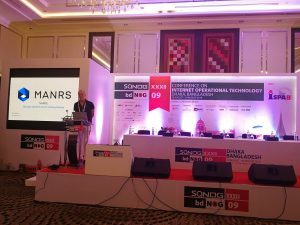 Dr Philip Smith (NSRC and Chair of SANOG Programme Committee) also provided a MANRS update during the conference session. 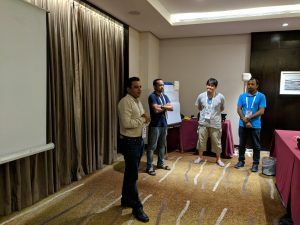 The Network Security workshop attracted 40 participants and was lead by MANRS founding member Matsuzaki Yoshinobu (IIJ) and Champika Wijayatunga (ICANN), with local support provided by Moinur Rehman and Anirban Data. 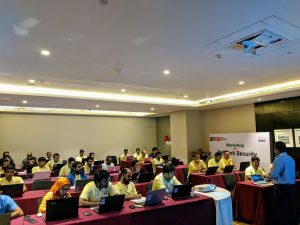 This featured a hands-on lab where participants learned about the four MANRS action – namely Prefix Filtering, Anti-Spoofing, Coordination and Global Validation. 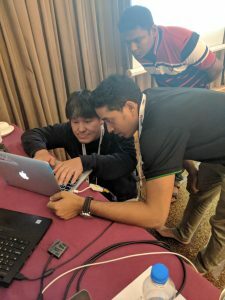 APNIC staff also demonstrated how to update Whois information through MyAPNIC, how to create route/route6 objects, as well as how to create Route of Origin Authorisations (ROAs) for the Internet number resources (IP addresses and AS numbers) under their management. These steps are important in achieving two of the MANRS actions – Coordination and Global Validation. The South Asian Network Operators Group (SANOG) was started in 2003 to bring together engineers and industry experts from network operators for the purpose of knowledge sharing as well as co-operation among all the relevant stakeholders in the South Asian region which covers Afghanistan, Bangladesh, Bhutan, India, Maldives, Nepal, Pakistan and Sri-Lanka. The SANOG meeting incorporates workshops and tutorials in conjunction with the conference, and people from the community are invited to contribute as workshop instructors or share their experiences through tutorial or conference presentations. Many network operators in the region are in the nascent stage of development, such helps valuable. Special thanks to Sumon Ahmed Sabir (SANOG Founding member and Core Com), Gazi Zehadul Kabir (SANOG Chair), Rashed Amin (Vice President ISPAB), Md.Emdadul Hoque (Secretary General ISPAB) and Simon Sohel Baroi (SANOG PC Chair) for the great support. Its great to see MANRS getting support in the Asia Pacific region. If you are running a network infrastructure then be part of the solution and help protect the core. Join MANRS.